According to the Arthritis Foundation, an arthritis flare is defined as a period of time when you experience worsened symptoms unexpectedly. These episodes can be a debilitating period when joints are swollen and in pain after days of feeling comfortable. Medication is often sought out to control these flares, but may not always have the ability to mitigate the pain. Although the timing of a flare can be uncertain, there are certain early warning signs that may indicate that the debilitating discomfort is on the way. Slight, dull aching in the joints is one to be mindful of, as is fatigue during the day. Because flares occur unexpectedly, it's important to prepare in advance as much as you can. 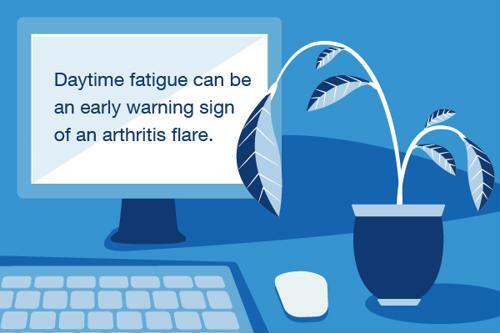 The Arthritis Foundation recommended saving up sick time and making adjustments to your normal schedule in the event of a flare occurring so you have the bandwidth to stay home, relax and reduce the risk of overusing your joints. Everyone's body needs a chance to rest, and if you live with arthritis, this is especially true for your joints. However, too much unwinding can actually cause your joints to stiffen, making a flare worse or more likely to occur in the first place. Instead of staying in bed all day with an arthritis flare, throw in a few periods of low-impact activity to keep your joints in full range of motion, as the Arthritis Foundation suggested. Just remember to understand your personal threshold; don't overwork your body during a flare. Some people recommend using a heating pad while experiencing an arthritis flare, while others will suggest applying a cold compress. Both pieces of advice are correct, but you may consider combining hot and cold therapy to cope with the pain. Heat increases blood flow while cold reduces inflammation. Start by applying a heat patch or warm compress for 15 minutes, then switch to a cold pack for 15 minutes. Repeat this pattern two to four times a day during the flare-up. Whether you're living with arthritis in your hands, wrists, elbows or knees, one of the IMAK Compression products from Brownmed can help you cope with an unexpected flare. Each item is designed to reduce swelling, improve circulation and create warmth in the affected area to provide relief throughout the day. These products make it easier to go about everyday activities without having to stop and deal with the pain of a flare. Learn more about which IMAK Compression product makes sense for you by browsing the Brownmed product catalog today.